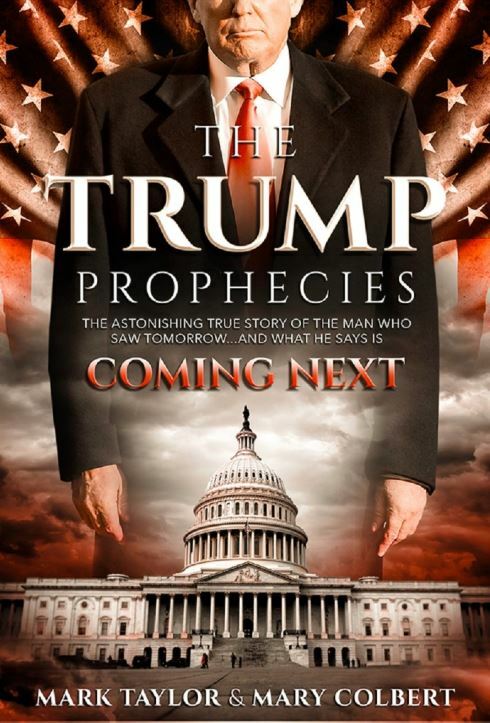 Thread by @blmohr: "Rove, Blackwell, Trump, New Media, SmarTech, GovTech and the improprieties of elections. 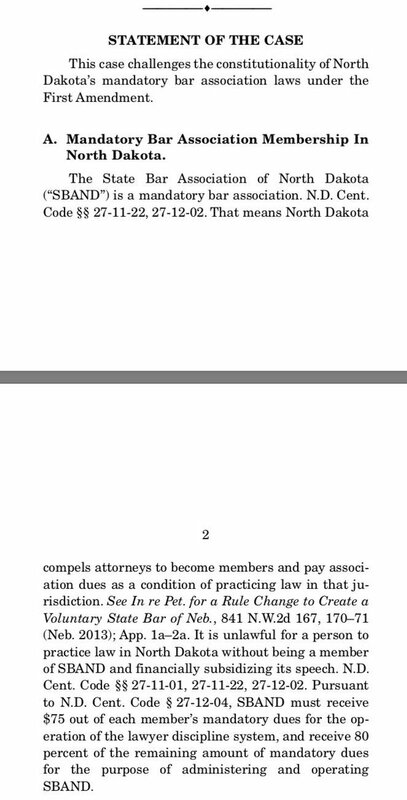 [Thread] In 2000, the SCOTUS decision in Bush v. Go […]"
Various factors contribute to this narrow margin. 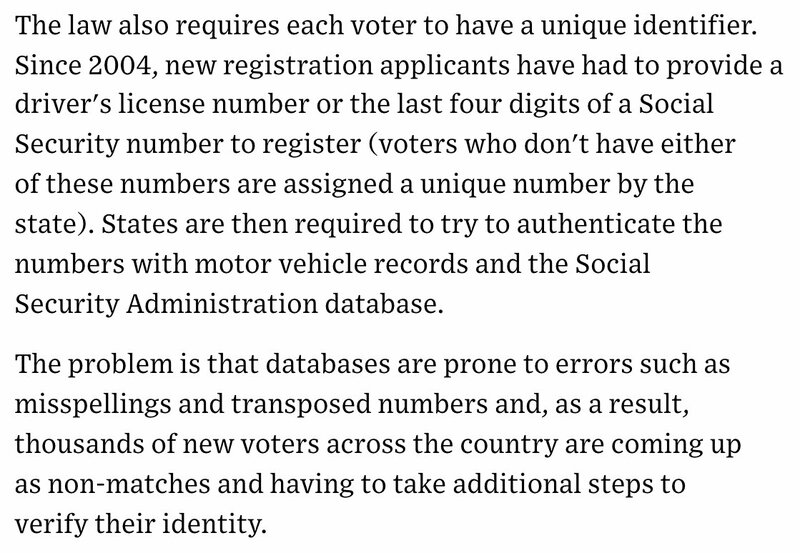 Among them, voter disenfranchisement, poll reporting mistakes and computer "errors." Diebold makes paperless, touchscreen voting machines. There are major concerns regarding these machines. According to experts that have tested them, they don't meet standard requirements and "can be hacked w/ relative ease." CBS News releases a full analysis of the various 2000 election night issues. Karl Rove enters the WH as Bush’s informal policymaker. Over time, he ushers in a powerful group of IT companies like SmarTech, GovTech Solutions and New Media Communications. These companies are run by Rove’s Chief IT Consultant Mike Connell. Prior to the election, Connell has worked for various GOP entities. In 1988, under George H.W. Bush (R-TX), he’s tasked with designing the RNC database software system. 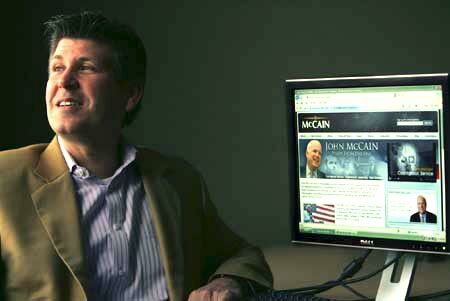 In 1990, he works on Dan Coats' (R-IN) Senate campaign but is fired due to "unethical" behavior. In 1994, Connell establishes his business as New Media Communications. John Boehner's (R-OH) Freedom Project PAC. 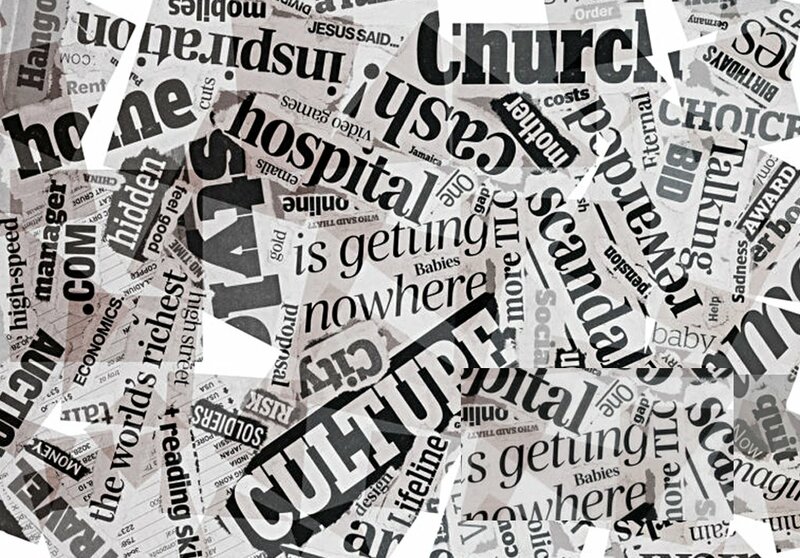 New Media also takes on heavy hitter clients like the NRA, the RNC and the George W. Bush website. In 1998, Jeb Bush hires Connell as his Internet strategist for his Florida gubernatorial campaign. While retaining its base in Connell's OH home basement, New Media opens satellite offices in Tallahassee, FL and Washington, D.C. The DCI Group is headed by Tom Synhorst. push-poll phone banks, voter turnout projection models and micro-targeting email campaigns. In 2000, Connell and Synhorst launch GovTech, an offshoot of New Media, to handle government websites. brand and its operations are based in Chattanooga, TN. 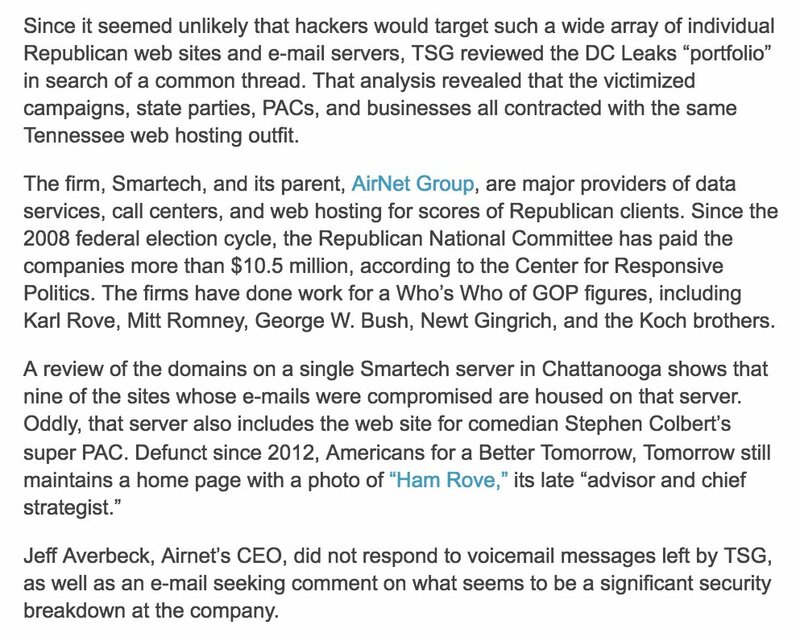 Now, ALL GovTech and SmarTech's data for ALL of its GOP and government clients is hosted on Airnet's servers. Thru the partnership of these comps., and the insane number of clients they have, a massive amount of public data is collected in 1 place. Perhaps the first collection of its type and size, except for (maybe) NATSEC entities, in the history of the U.S. 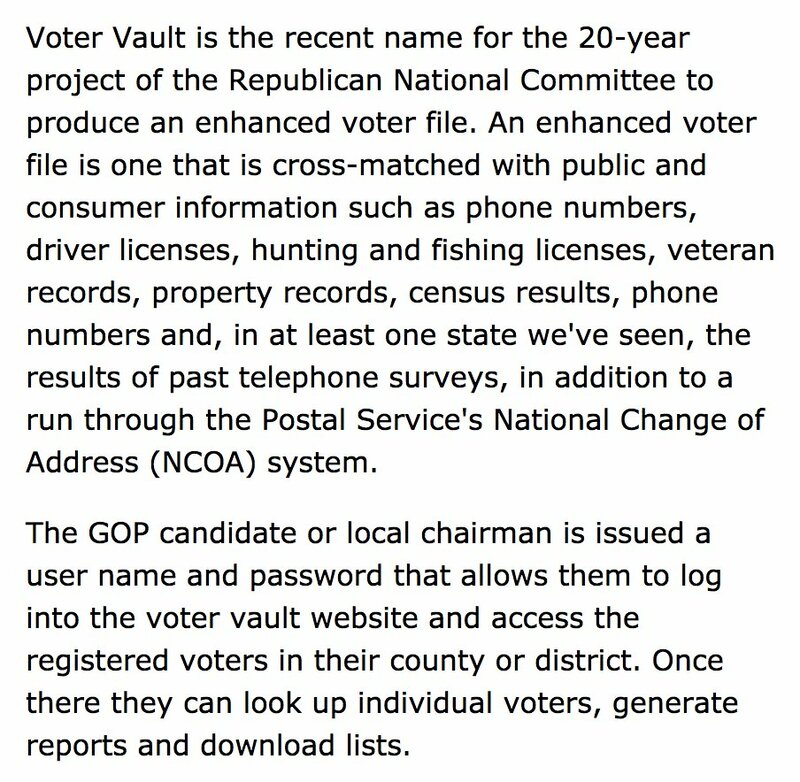 Using this data, Connell and Averbeck pioneer Voter Vault, an extensive database of nearly every voter in the country. 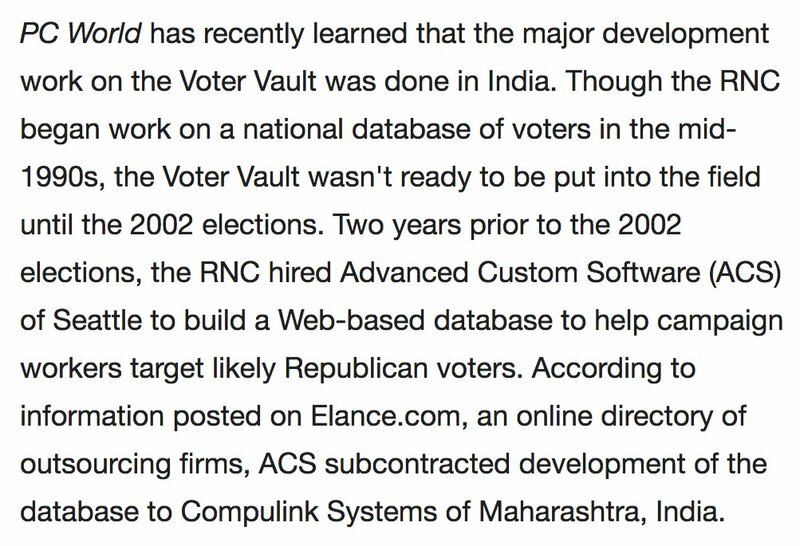 In 2000, Voter Vault is shipped overseas to India for "major development work." Voter Vault is now locked and loaded. GOP political ops with access can now utilize troves of data to be mashed up in various ways to benefit whatever agenda they have in mind. On Oct. 29, 2002, the Help America Vote Act (HAVA) is signed into law by President Bush. The law requires all election districts in a state or U.S. territory to consolidate their lists into a single database. The database is electronically accessible to every election office in the state or territory. The law raises concerns of potential voter purging. On Feb. 24, 2003, Ohio Sec. of State, Kenneth Blackwell is summoned to the WH by Rove. Rove tells Blackwell Ohio will play a crucial role in the 2004 presidential election. Ohio is very important to Rove. Partly because no Republican has won the WH w/out winning Ohio since the Civil War. Shortly thereafter, Blackwell announces Ohio will pay $100 million for new voting machines. These machines are very similar to those used in the 2000 presidential election. 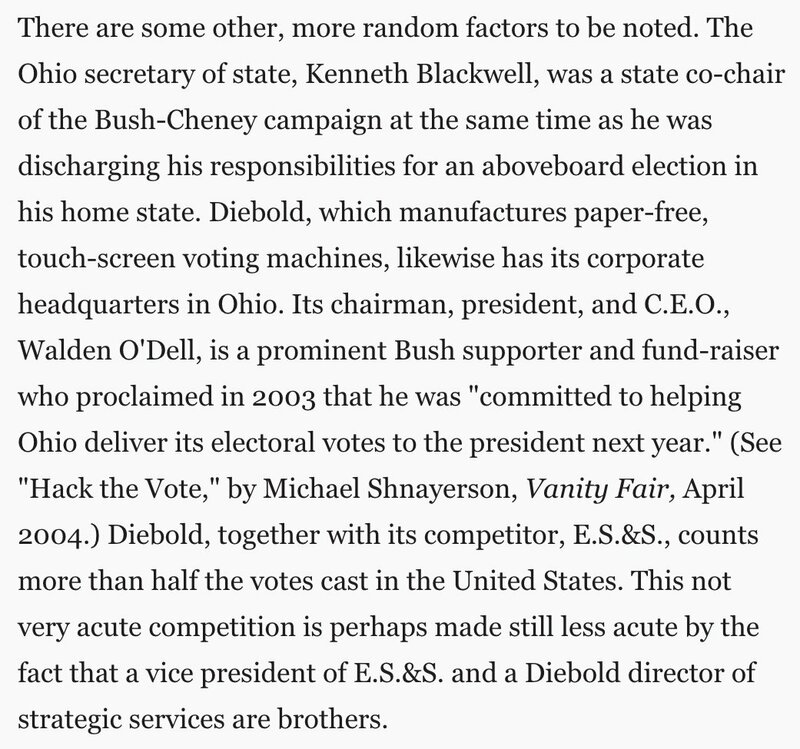 In July 2003, OH State Sen. Jeff Jacobson asks Blackwell to disqualify Diebold Election Systems' bid to supply voting machines to OH. Blackwell is in charge of running state elections while also being the state co-chair of the Bush-Cheney campaign. 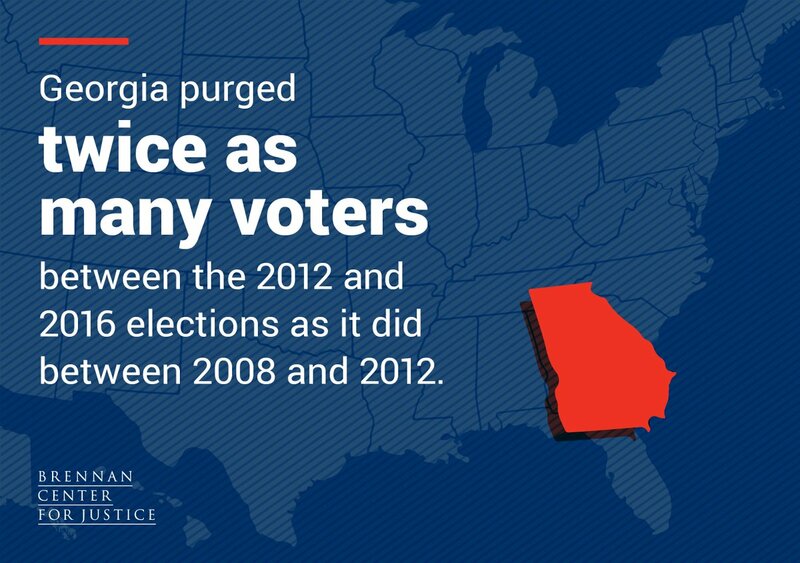 Prior to the 2004 election, more than 350,000 voters are purged w/out explanation from the registration rolls. GovTech to alter votes in the Diebold voting machines. SmarTech and/or GovTech can then allegedly alter votes before they are relayed to the county computers that report final vote tabulations. On election night Tues., Nov. 2 at 11p.m., “radically different ratios of Kerry to Bush votes” in eight OH counties are observed. image management and remote electronic monitoring. Upon further review, Spoonamore finds at least 12 Ohio counties with questionable vote counts. An SOW is later revealed between the Office of the OH Sec. 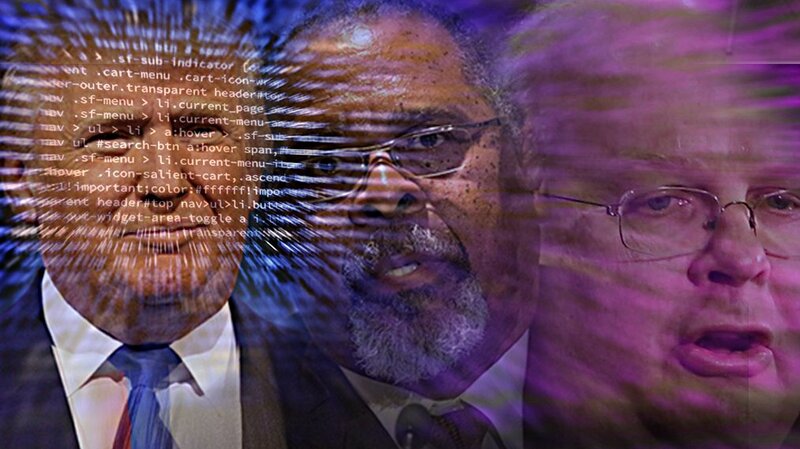 of State and GovTech as proof of the planned alternate computer system setup. Bush wins the election and gains another four years in office. his views on what happened. March/April 2006, Blackwell's office "accidentally" releases nearly 7 million Ohio voter Social Security numbers. Aug. 31, 2006, the King Lincoln Bronzeville v. Blackwell case is filed. Nov. 2008, Connell is forced to testify about events leading up to and during the 2004 Election. Connell dies in a plane crash on Dec. 19, 2008. On Nov. 4, 2008, Barack Obama becomes the 44th U.S. President. He repeats in 2012. In Aug. 2012, Blackwell is questioned about voter suppression. In Nov. 2012, Anonymous claims it stopped Karl Rove from hacking the vote in favor of Mitt Romney. The DNC is hacked and emails are published by WikiLeaks on July 22, 2016. Certain GOP members' email accounts are also hacked. were compromised are housed" on a SmartTech server. On July 1, 2017, states do a collective eye roll when the Pres. Advisory Comm. on Voter Integrity asks them to turn over voter data. Trump claims it's because millions of illegal votes had robbed him of a popular-vote victory over Hillary Clinton. He also accuses the states of trying to hide something. On July 9, 2017, Blackwell is tasked w/ serving on the Presidential Advisory Commission on Election Integrity. Blackwell has been involved w/ at least 16 election-related lawsuits. a data analysis firm working for the RNC. On Aug. 8, 2017, the DOJ reverses position and decides to defend Ohio in voter purge cases. four years or update their address. On Sept. 22, 2017, DHS notifies 21 states that Russia attempted to hack their election systems. The AirNet Group, GovTech and the DCI Group remain open for business. 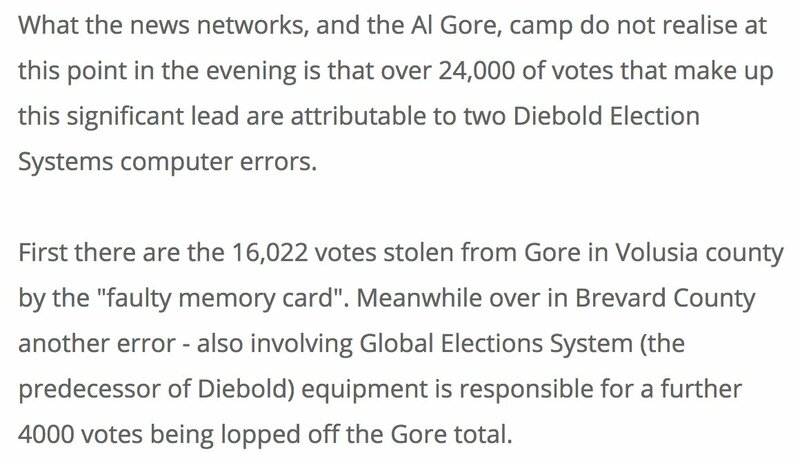 Numerous states continue to use easily hacked, paperless voting machines built by Diebold, ES&S and other companies. The midterm elections are scheduled for Tues., Nov. 6, 2018. See the Pres. Advisory Comm. on Election Integrity for a list of current members and updates on what they're doing. Also, please consider following me as I have more threads to come. 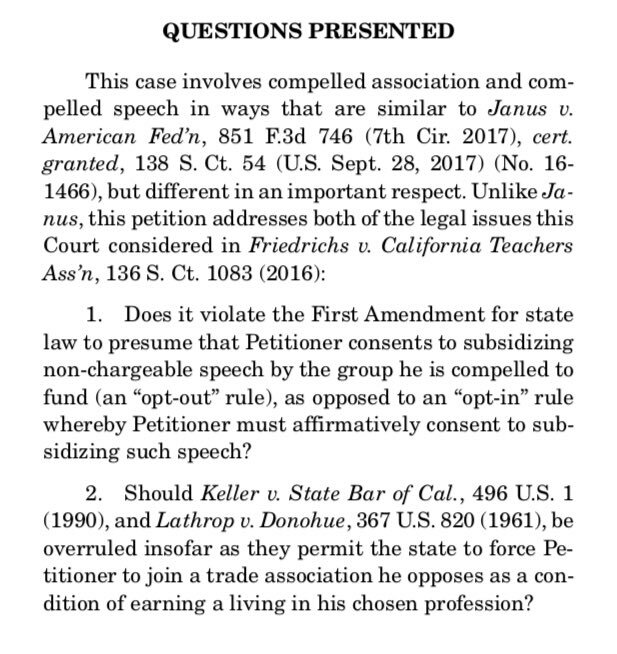 The court did GVR 2 cases—grant, vacate, & remand—asking lower courts to reconsider a ruling in a case in light of a recent #SCOTUS decision. 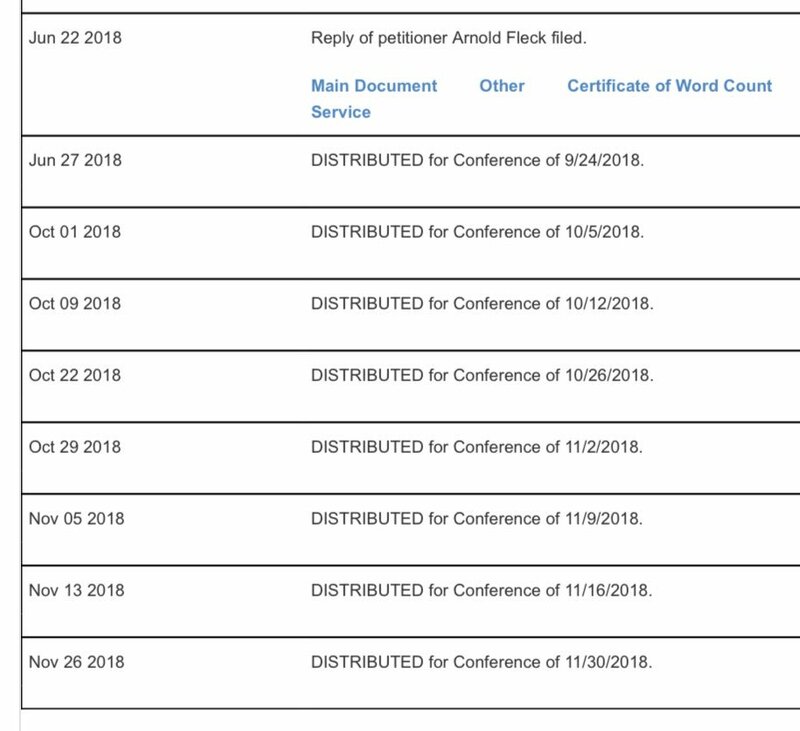 While the one GVR is based off of a decision issued last week, the Fleck GVR follows several conferences & the Janus decision from June. It's a one-box day at #SCOTUS. Opinion(s) coming in moments. 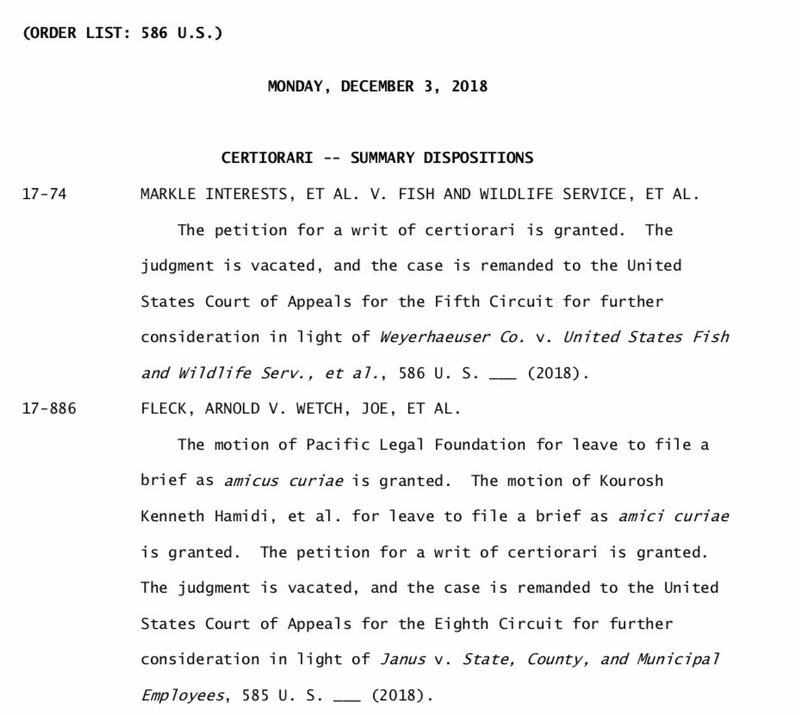 First — and only — #SCOTUS decision today is from Chief Justice Roberts in Weyerhaeuser v. US Fish and Wildlife Service, vacating and remanding the 5th Circuit. Decision was unanimous, though Kavanaugh did not particpate. 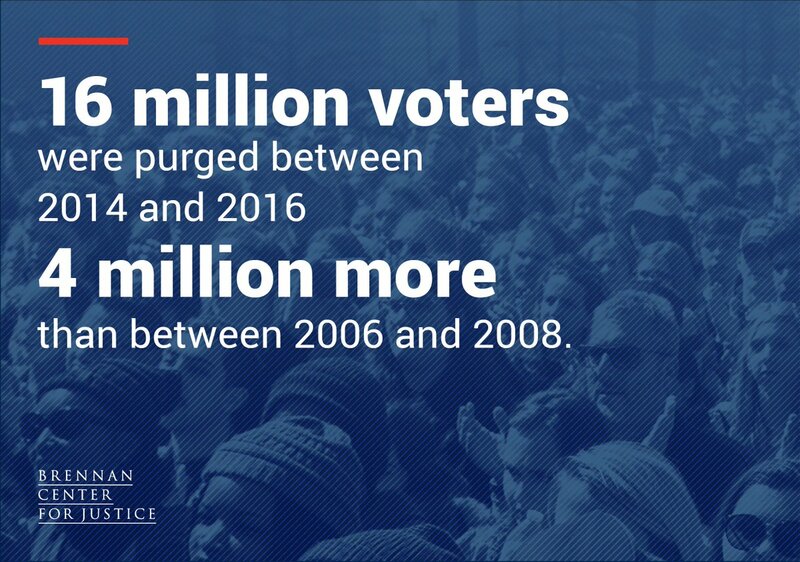 (2/8) Almost 4 million more names were purged between 2014 and 2016 than between 2006 and 2008 — 33% growth, much higher than the growth in eligible voters and in the larger population. 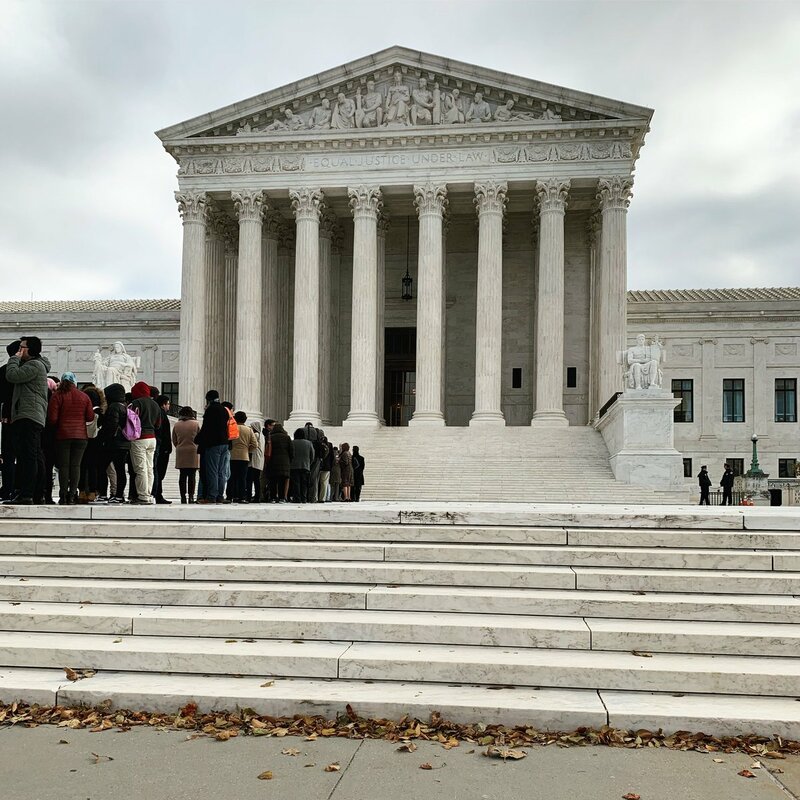 (3/8) Purge rates have increased more in states that, due to their history of #racialdiscrimination, were previously subject to federal "preclearance," a practice that ended with the 2013 #SCOTUS decision Shelby County v. Holder.